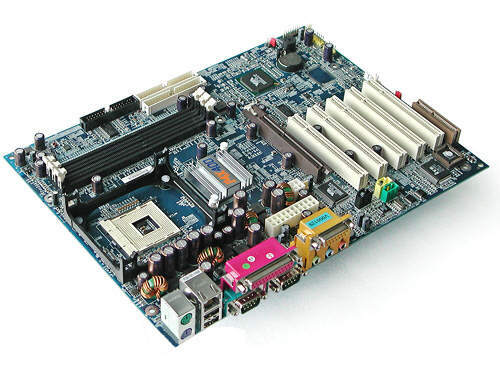 The P4PB 400 fully exploits the performance and connectivity capabilities of VIA's most advanced chipset combination, the Apollo P4X400 North Bridge and VT8235 South Bridge. Performance features includes AGP 8X and 533MHz FSB support, as well as the industry's fastest memory controller, providing the PentiumR 4 with up to 3200MB/sec of fast DDR/400333 SDRAM memory. The P4PB 400's unsurpassed connectivity features includeintegrated USB 2.0/1.1, IDE ATA/133, onboard IEEE 1394, 10/100 LAN, and a Smart Card connector. An onboard VIA VT1616 audio chip provides six channels of studio quality, crisp, digital surround sound and supports both optical and SPDIF outputs. The P4PB Pro is bundled with a SPDIF connector bracket that fits neatly into any available PC chassis I/O expansion slot. The SPDIF brackets enables digital to digital signal transfers between devices thus eliminating the signal degradation associated with traditional analog audio. Network connectivity is provided through the onboard VIA VT6105M 10/100Mbps Ethernet LAN chip. The VT6105M is VIA's most advanced LAN chip featuring Wake-on-LAN, remote bootability and multiple VLAN, resulting in increased system performance, security, and easier network management. The onboard VIA VT6306 IEEE 1394 chip and integrated VIA USB 2.0 enables seamless connectivity to all the latest high speed multimedia devices such as digital video cameras, MP3 players, and printers. 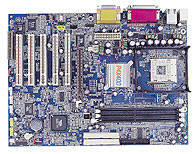 The VIA P4PB 400 full featured ATX form factor layout offers unsurpassed scalability, with three DDR SDRAM DIMMs, five PCI, one AGP, and a CNR slot. The VIA P4PB is also bundled with FliteDeck?, the extensive system management suite that enables advanced features such as overclocking, system monitoring and BIOS updates and comprises four utilities, MissionControl, JetStream, FlashPort, and SysProbe.